As a developer, you might face few requirements where you want to upload large documents, PDF's and images from your application. Then how do you manage and store such large data? Usually, traditional approach was to store those large files on web server's file system. But you also have database approach which allows you to store those large documents like PDF's, .zip files, images etc., as binary data directly in the database itself. Let's elaborate on Database approach a bit further. How do we usually store large data objects in Databases like SQL Server 2000? Ok, SQL server 2000 supports exclusive image data type to hold image data. Now SQL Server 2005 supports another new data type varbinary which allows storing binary data up to 2GB in size. Even with new data types, we still need to understand that working with binary data is not the same as straight forward working with text data. So, we are here to discuss how to use ASP.NET 2.0 SqlDataSource control to store and retrieve image files directly from a database. This table records details of pictures and content. 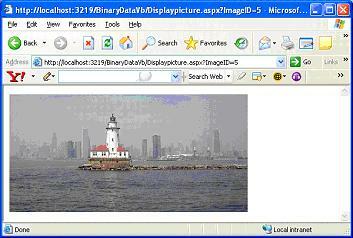 The PictureTable table's MIMEType field holds the MIME type of the uploaded image (image/jpeg for JPG files, image/gif for GIF files, and so on); the MIME type specifies to the browser how to render the binary data. The Image column holds the actual binary contents of the picture. As shown above, we are using Fileupload control to browse picture files on hard disk. 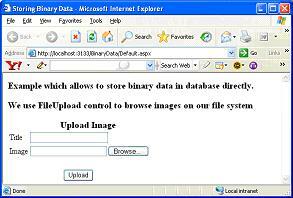 FileUpload control is a composite control which includes a textbox and browse button together. To add this control, simply drag and drop FileUpload control from Toolbox as shown below. Once user selects appropriate picture file using FileUpload control, click upload button which inserts selected image into PictureTable as new record. The logic to insert the image into PictureTable is handled in Click event of Upload button as shown below. Label1.Text = "Please Upload Valid picture file"
Label1.Text = "Not a Valid file format"
Const SQL As String = "INSERT INTO [Pictures] ([Title], [MIMEType], [Image]) VALUES (@Title, @MIMEType, @ImageData)"
Once the user has selected a file and posted back the form by clicking the "Upload" button, the binary contents of the specified file are posted back to the web server. From the server-side code, this binary data is available through the FileUpload control's PostedFile.InputStream property. This event handler starts off by ensuring that a file has been uploaded. It then determines the MIME type based on the file extension of the uploaded file. You can observe how @ImageData parameter is set. First, a byte array named imageBytes is created and sized to the Length of the InputStream of the uploaded file. Next, this byte array is filled with the binary contents from the InputStream using the Read method. It's this byte array that is specified as the @ImageData's value. Therefore, to display an image on a web page, we can use an Image control whose ImageUrl property is set to the appropriate URL. Const SQL As String = "SELECT [MIMEType], [Image] FROM [PictureTable] WHERE [ImageID] = @ImageID"
The DisplayPicture.aspx does not include any HTML markup in the .aspx page. In the code-behind class's Page_Load event handler, the specified Pictures row's MIMEType and Image are retrieved from the database using ADO.NET code. Next, the page's ContentType is set to the value of the MIMEType field and the binary data is emitted using Response.BinaryWrite(Image): When DisplayPicture.aspx page complete, the image can be viewed by either directly visiting the URL.